About two weeks ago, the white tents were raised in downtown Toronto signalling the return of fashion week and of course, we got excited. 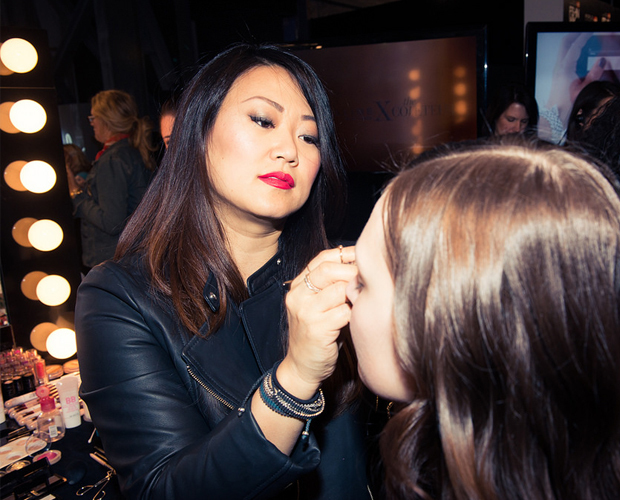 When Maybelline invited us for a backstage sneak peek pre-show to see make up artist Grace Lee work her magic on the models, we jumped at the chance. Ladies, I know my concealers. Having battled some pretty nasty skin issues in my teens (and then well into my adulthood), concealer was the first beauty product I got my hands on and would probably be number one desert island choice. My morning and night skincare routines used to be quite the process. Just read this article from a few years back. Since then, I have been focusing on streamlining and simplifying. With a drawer full of half used products, I seriously needed to cut back. So I decided that my routine needed to fit into one clear travel bag and that all my products would be useful. I happened upon Imm Living products at an Interior Design showcase and every time I laid eyes on something, I turned to my friend to exclaim, 'OMG. So. Cute.'. When we ditch the beanies, hat hair and static for warmer weather, it's time to celebrate. This spring, we're going to get you excited with some great hairstyles! The runways were fresh with romantic spring looks, whether it was floral accessories or messy, milkmaid braids. At the same time, we saw sleek, sophisticated looks represented with no nonsense ponytails and slicked back do's. When spring rolls around (whenever it darn well chooses to because like, HELLO, I AM WAITING), it means two things to me: It's time to break out my new Zara coat that I purchased two months ago in hopes it would get warmer and SPRING MAKEUP RELEASES!